KuCoin’s journey was full of challenges since they’ve started. But these hardships didn’t stop them from moving forward and in fact, become one of the world’s leading cryptocurrency exchanges in this era. 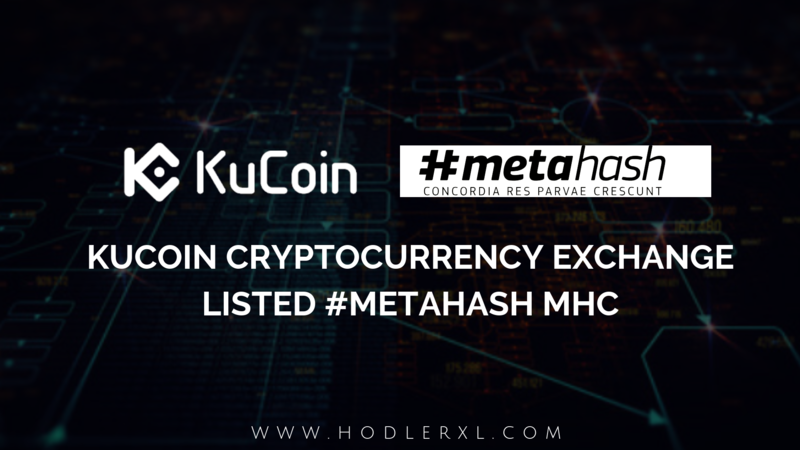 And today, they are proudly announcing the listing of another unique and promising token of #Metahash. Deposits are now available with supported trading pairs including MHC/BTC and MHC/ETH. All trading transactions are done using KuCoin’s Android and iOS applications or to their official website at www.kucoin.com. #MetaHash is recognized as a decentralized network for digital asset exchange and a platform for developing decentralized applications that operate in real time. It is created to build a single solution that enables blockchain systems of the future to unite into a single decentralized network, proficient of recording every transaction. The self-regulating #MetaHash network produces a basis for the development of a fully-fledged branch of the decentralized internet. It doesn’t depend on particular creators once launched and is directed by open voting1 of users or #MetaHashCoins2 holders. A fully decentralized internet would take freedom from the power of large corporations. Project management would be in the hands of end users. #MetaHash network has four elements. First, #TraceChain which is #MetaHash’s answer to the transaction speed issues challenging existing blockchains. It is an automated self-learning algorithm for signal routing, with opening speeds of around 50,000 transactions per second. #MetaHash affirms that the system is extremely scalable as the #MetaHash network increases in the number of nodes and processing power. #MetaHash network also has #MetaApps. It is a code prioritizing network resources and node owners’ financial impulse to optimize the location of application copies. Basically, developers’ apps will be voted on by #MetaHashCoin holders based on those holders’ values. #MetaGate browser works as the portal by which developers can enter the #MetaHash network, and the #MetaHashCoin itself is the network’s native currency. #MetaHash is considered of like a conglomerate comprising of three different companies and their respective leaders. The first co-founder is Gleb Nikitin, founder of automated ad placement system AdSniper. The second one is Adnow CEO, Vladimir Bashkin, and the third is investment firm leader Anton Agranovsky. The teams behind each respective company are all contributing to the development and operation of #MetaHash. Although the project is registered in Switzerland, most of the development team’s collective background is in the Russian market.